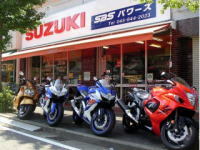 Suzuki motorcycles, from purchase to after-sales maintenance Please leave it to POWERS of Suzuki specialty shop! SUZUKI NEW BIKES SPECIAL PRICE! PGO with many sporty models, and also have a lineup of classic and cute models. With a style full of originality, PGO is developing models of 168 cc from 125 cc. SYM is a motorcycle brand in Taiwan centering on scooter. They began exporting from 1982 and now, selling in more than 30 countries around the world. Landed in Japan in 2003 and the name recognition has akready risen as well. With a lineup of 50 to 250 cc, you can choose from around 20 models. KYMCO is a Taiwanese motorcycle brand and exported to more than 50 countries around the world. It is also popular in Europe, and KYMCO has taken the top share in some departments in Italy or France before. About KYMCO, we currently receive only genuine parts supply and exchange / repair.